Catholicism has untold numbers of saints and many of them are beloved. It is only right that in a “universal church” that this should be so; sanctity and holiness are not the exclusive property of a few and the seemingly exponential variety and kinds of sainthood there is offers great hope to those of us within the fold of faith who hope and aspire one day to be not only like them, but to be with them. When asked who is the most popular saint or whom do they personally venerate, many people would quickly come up with someone like Saint Francis of Assisi, “the poor one” who befriended man and beast and loved the nature that God bestowed upon man and the physical world in which he inhabited. But it is also fair to say that an equal—or possibly greater number—would choose Saint Anthony of Padua (whom my late father Harry had a great devotion to, besides Saint Patrick), the patron of many things: the “wonder worker” who guides the lost and helps them find their way back to whatever it was that was being searched for. In religious imagery, Saint Anthony of Padua is especially beloved; apart from the Holy Family, he is the probably the only saint depicted with the Christ Child and in a particularly tender way: he is often shown holding a book (presumably the Bible) in one hand and the Child Jesus in his other hand while stalks of white lilies (representing purity, innocence and integrity) are present in the foreground. But what is noticeable in these depictions is the fact the Child Jesus tenderly puts his hand on the saint’s face, as if to simultaneously embrace him and bless him. It is a picture that evokes a child’s love toward his parent and the parent's love toward his child. As a matter of fact, statues have depicted this scene ever since the 17th century. But it is no mere pious representation: it really happened in the saint’s lifetime. One night the Divine Child visited Anthony, kissed him and told him that He loved him. Anthony, in that visitation, was entrusted with the Child Jesus and the lilies that are always depicted in religious art represents that trust and divine favor. It is no wonder that such a representation is so loved; it expresses the want of the human heart. Saint Anthony of Padua is a Doctor of the Church; he was proclaimed so on January 16, 1946 by Pope Pius XII. In his life, Anthony was renowned for his preaching and his erudition; he preached throughout his native Portugal as well as Italy. Because his preaching to heretics was so successful, he was given as a nickname, “The Hammer of Heretics.” (Interestingly, after his death, when Anthony’s body had turned to dust, something miraculous happened: his tongue did not decay. It is in a reliquary and is venerated; it remains as a physical reminder of his preaching and eloquence.) He even impressed Saint Francis of Assisi, who, while famous for being distrustful of books and learning, and fearful for the poverty of the brotherhood he led, found a kindred spirit in Anthony and entrusted to him the task of the proper religious education of his band of brothers. And after hearing Anthony preach, Pope Gregory IX declared him to be a “jewel case of the Bible” and ordered him to collect his sermons into a book that eventually became Sermons for Feast Days. Pope Gregory IX portrayed him as Doctor Arca testamenti, or “Ark of the Testament.” The man who was born into a noble Portuguese family (on August 15, 1195) and had entered religious life at a very young age (at 15) and went on to become a Franciscan friar and noted preacher had made his mark before saints and popes alike, but it was to the ordinary folk that he really came to be known and loved. He would die at age 35 (on June 13, 1231), worn out from his labors and from the disease called ergotism (a disease that results from eating infected grain and results in various symptoms such as a burning sensation which, in Anthony’s case, eventually came to be famously known as “Saint Anthony’s Fire”). Saint Anthony of Padua might be regarded as the saint of miracles, but he was also the saint of legends, too. Take, for example, the legend that he is most famous for, that of being the patron saint of lost things. It all started with Anthony himself, for he lost something once: a book. It so happened it was a psalter, and it contained many notes and learned addenda. Like anyone in a similar position, he fretted over the valuable item that was lost. It turned out that the culprit in this case was a novice (other versions have him being a priest). What made it really interesting is the fact that this novice (or priest) who stole the book also “stole” his way out of religious life: he left it behind while taking the psalter. But the priestly psalter thief did not get away with it, though. One night he had a bad dream—and a bad dream it was, for as the story goes, an angry Saint Anthony appeared in the dream, demanding the return of the absconded item. The priestly psalter thief did just that, by personally returning it to Anthony and for good measure, he returned to religious life too! An equally famous legend is the one called “Saint Anthony’s Bread.” The oldest version of Saint Anthony’s life extant is called the Rigaldina, and it recounts the period when the Basilica of Saint Anthony (after the saint’s death) was being constructed in Padua, Italy. It seems that a young mother had a little boy named Thomas, who was 20 months old. It so happened that she left her son alone in the kitchen. Busy mother that she was—like all mothers are—she probably had to attend to something in the interim and would return shortly to her kitchen duties as well as her son. However, Thomas—like all little boys everywhere—couldn’t be still for long: he saw a tub of water and decided it was play time. Unfortunately, he ended up head first in the tub of water; and when his mother returned, she found her son lifeless. The mother let out a desperate scream and then, an even more desperate prayer: she called upon the saint of Padua in her hour of distress. She made a vow: if her son was revived, she would donate bread equaling her son’s weight and feed it to the poor. The earnest prayer was heard and the child was brought back to life and the poor were thereafter fed. And the legend of “Saint Anthony’s Bread” began. The legend of Saint Anthony’s Bread was also furthered by another instance, but this time it involved a lost key. It so happened that a French shopkeeper named Louise Booffier of Toulon had lost the key to her shop door. So, like the lady in Padua, she vowed to give bread to the poor if somehow the locksmith could open the bolted door without incident; so she prayed that she could get into her shop. The miracle happened and she kept her promise. 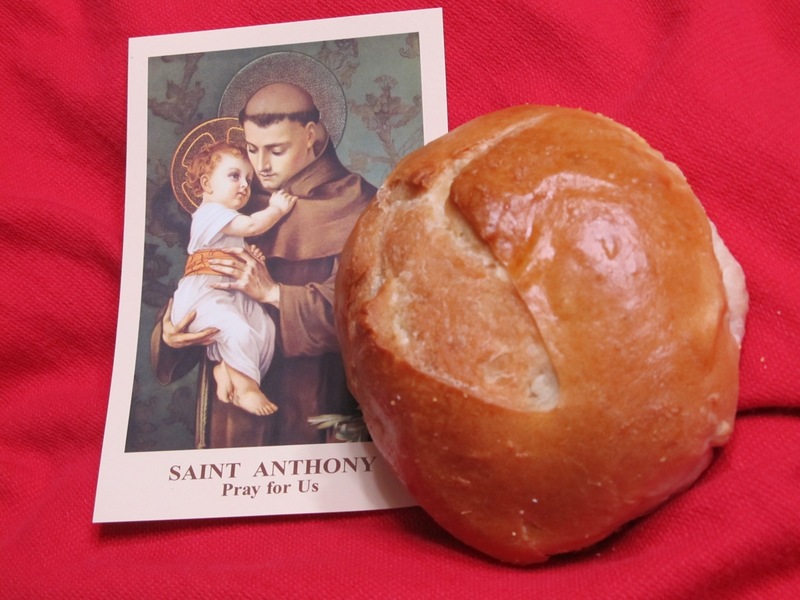 She started the charity of giving bread to the poor and thereafter on Saint Anthony’s feast day—June 13—loaves of breads are blessed in churches, signifying gratitude for favors received through the saint’s intercession. Most of all, what St. Anthony is most famous for is what he is renowned for: being the patron saint of those who seek the love of a spouse! He’s often referred to as the “Matchmaker Saint” and he is especially invoked on Saint Anthony’s Eve, when young people supposedly write letters asking Saint Anthony for help in seeking a mate. Another custom has it that a young man—if he hopes to impress the girl he hopes to marry—must present to the intended a pot of basil, concealing some romantic verse or that magical love letter!